Concurrent programming using Actors is different to traditional mutex based approaches, therefore I'd like to show how the solution of a classical concurrency problem can be done using Actors. 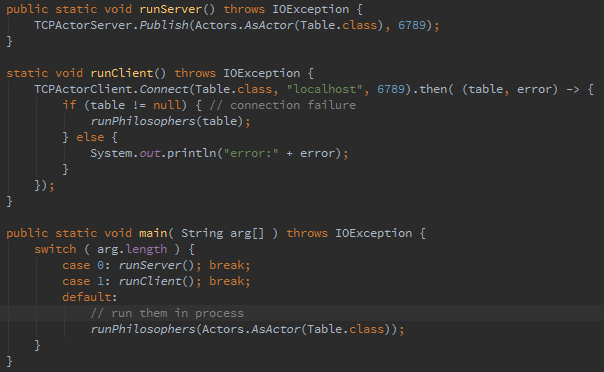 It requires some time to get used to it as future/actor based concurrency looks different and uses different patterns. Additionally I'll show how little effort is required to make this a distributed application, as asyncronous Actor based concurrency is much more resilient regarding network induced latency. I'll use my Kontraktor Actor library version 2.0 beta to also illustrate how the "message == asynchronous method call" approach of Kontraktor works out in "practice". Full source of sample is here. One actor represents the table. For each fork, a list of philosophers waiting for "fork is free"-notification is kept. Short explanation: In Kontraktor all public methods are translated into asynchronous messages put on to an actors queue ("mailbox") behind the scenes. The worker thread of an actor takes the messages of the mailbox and calls the "real" implementation. So its guaranteed an actor is executing single threaded. To identify asynchronous calls easily, I always put a $ in front of public actor methods. 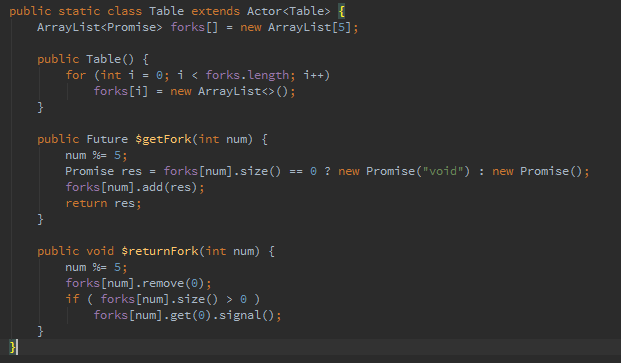 Once a fork is returned, the next Promise in the arraylist (if any) is notified. signal() is equivalent to receive("dummy",null). Note that the "result" object is unused, I just need a signal from the future returned. That's why the fulfilled Promise gets a "void" as a dummy result object (which will then trigger immediate execution of the then-closure on caller side). 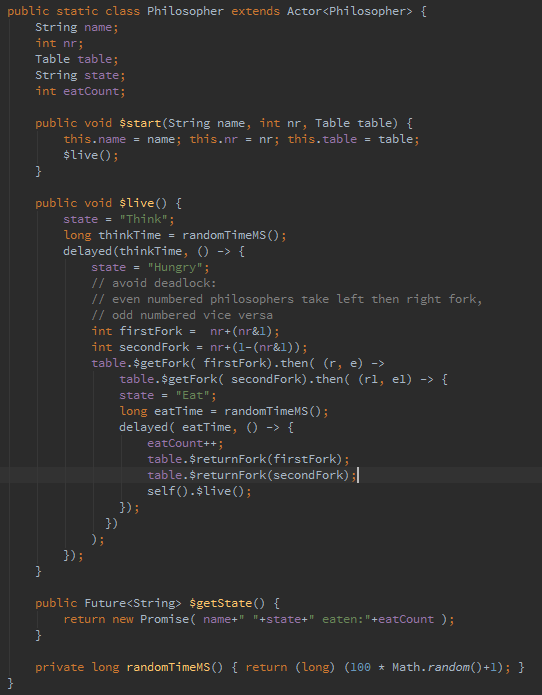 Note how I can use simple single threaded collections and data structures as the actor is guaranteed to be executed single threaded. After thinking, the philosopher tries to grab one fork, the closure given to the "then" method gets executed once the fork becomes available. Once both forks have been grabbed, another "delayed" call keeps the "eat" state for a while, then both forks are returned and a $live message is put onto the actors mailbox (=message queue) to start thinking again. "delayed" just schedules the given closure onto the actors mailbox with a delay. "self().$live()" puts a $live message onto the actors mailbox. If "this.$live()" would be called, the $live() message would be executed directly [synchronous] like a normal method. In this example this would not hurt, however in many cases this makes a difference. "Is this still Java?" .. probably weird looking stuff for the untrained eye ..
BTW: spacing is somewhat inconsistent as I started to reformat code partially during edit .. but won't do screenshots again .. The killer feature of Actor based asynchronous+lock/wait free programming is simple distributability. A solution using blocking mutexes would have to get a rewrite or rely on synchronous remote calls, so the bigger the network latency, the lower the throughput. Actors do not suffer from that.